I LOVE grapefruit. It’s so incredibly delicious despite having a few unfortunate grapefruit/car sickness moments that we won’t discuss on a food post. 😉 Grapefruit is such a refreshing flavor, and I honestly just love citrus. Plus, the yogurt gave the cake a great tangy flavor. This is a very moist cake, but both Corrie and I had wished there was a little more syrup all the way through the cake so the recipe below reflects doubling the glaze and 1/2 the glaze. I would start with about 3/4 of the syrup and then see how it goes so it doesn’t fall apart. Our desire was that the syrup wasn’t just on the top but all the way through, so my suggestion for next time is to poke holes through with a skewer like when you make tres leche cake so you get absorption all the way through! Sift together flour, baking powder, and salt into a bowl and set aside. In the bowl of a mixer, combine yogurt, 1 cup sugar, eggs, grapefruit zest, vanilla, and 1 Tbsp grapefruit juice on low speed. Add the dry ingredients and beat until just combined. Add the vegetable oil into the batter, mixing to make sure it’s all incorporated. Pour the batter into the prepared pan and bake for about 40 minutes, or until a cake tester placed in the center of the loaf comes out clean. Meanwhile, cook the 2/3 cup grapefruit juice and remaining 2/3 cup sugar in a small pan until the sugar dissolves and the mixture is clear. Set aside. When the cake is done, allow it to cool in the pan for 10 minutes. Carefully place on a baking rack over a sheet pan. Use a wooden skewer to poke holes about 3/4 of the way through the cake all over. 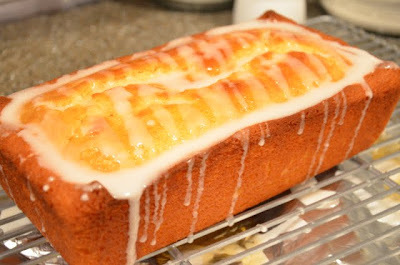 While the cake is still warm, pour the grapefruit-sugar mixture over the cake and allow it to soak in. Cool. For the glaze, whisk together the confectioners’ sugar and juice and pour over the cake.